The first Melmoth started life (in 1973) with a stabilator located more or less on the fuselage midline. This was a perfectly reasonable location. Unreasonably, however, the airplane also had a one-piece flap that passed under the fuselage and, when deflected, produced a lot of turbulent, separated flow in its wake. This disorderly flow affected the stabilator and its anti-servo tab, and was communicated to the stick as a buffeting that I felt needed to be corrected. It must be remembered that this was the Seventies. People wore strange clothes and hair, and T tails had a certain aura because of their prevalence on rear-engined jets like the Boeing 727. Beech and Piper both succumbed to the lure of the T tail, and so did I. There were of course aerodynamic justifications beyond the specific problems of Melmoth's flap turbulence. The T tail flies in undisturbed air outside the propwash and fuselage wake, and so is slightly more effective than a low tail and can therefore be made smaller. Sometimes an argument is made that the intersection drag of a T tail is less than that of a low tail, but that would be difficult to prove. It may not be true at all, since the intersections of the low tail are buried deep in the boundary layer, where the flow energy is relatively low. The arguments against the T tail on the basis of structural weight, susceptibility to additional flutter modes, and complexity of actuator paths ought to have been enough to discourage anybody who didn't have aft-mounted jet engines to contend with. But they weren't. A few months after I began to fly Melmoth I made a number of major modifications, including the addition of rear windows and the relocation of the stabilator to the top of the fin. I modified the fin by adding a second spar about 8 inches behind the existing one and closing the resulting box with a two-ply skin consisting of a flat outer sheet and an inner sheet with spanwise corrugations. A steel weldment carried loads from the stabilator hinges into the spar box. This arrangement was both structurally and aerodynamically successful. It eliminated the flap wake buffet, and also provided the airplane with a very pleasant landing characteristic. Probably because the low wing would enter ground effect while the stabilator was still outside it, Melmoth 1 would pitch up gently as it neared the ground -- that is, it would tend to flare all by itself, with very little pilot effort. 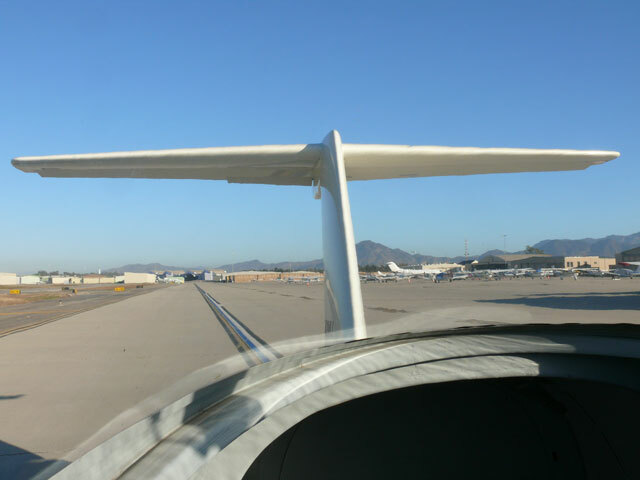 In contrast, low stabilizers often enter ground effect before the wing (especially before a high wing) and require increasing elevator effort in the flare. When I designed Melmoth 2, I was more or less committed to the T tail, but because I was less confident in my ability to design strong, compact joints in composites than in aluminum and steel, I decided to use a fixed stabilizer and trimmable elevator rather than an all-flying stabilizer. A fixed stabilizer, however, raises questions about pitch control authority at high angles of attack, when the stabilizer is flying leading-edge-up, and yet is called upon to produce a large downward force. A low tail, immersed in the wing's wake, has an advantage in this respect, because it is flying in air that has been deflected downward by the wing, and so it is really not so nose-up as it looks. The T tail enjoys less of a boost from the wing downwash, though it still gets a little help. The solution suggested by John Roncz was to set the stabilizer at a negative incidence of 3.5 degrees and carry a similar amount of down elevator at cruise. The suction created by the down elevator helps to stabilize the flow on the upper surface of the stabilizer, extending the run of laminar flow there and, at least in theory, cancelling some of the drag penalty of the surface inflection at the hinge line. I am of course not the only person who ever resorted to this arrangement; if you look at the horn balances on a Cessna 210's elevator, for example, you will see that they are angled downward with respect to the elevator. In cruising flight they align with the stabilizer, and it's the elevator that is deflected a few degrees downward. The crucial question was whether the tail would have sufficient authority to trim the airplane with a forward CG and with flaps down -- the combination that creates the most powerful nose-down moment. My calculations and computer simulations indicated that it would, but you can never be sure until you try. In fact, it does; at approach speed with full flap, the trimmed position of the elevator is about five degrees up, leaving 20 additional degrees of up elevator whith which to flare. In case you wonder what Melmoth would have looked like with a low tail, here's a CFD model that I've toyed with. As you see, it looks like any other airplane, so if the T tail has no other value, at least it is slightly distinctive.